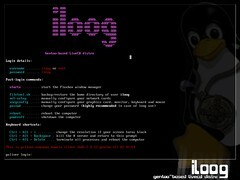 iloog is a Gentoo-based LiveCD produced by the Ioannina Linux User Group (I.L.U.G. ), targeted mainly at students and scientists. Our purpose is to create a multi-purpose tool that will suit the needs of our growing user-base through an intensive development process that follows the "release early, release often" paradigm of open source software. Apple MacBook photo kindly provided by Theocharis Athanasakis. You can find more screenshots at ILUG's flickr page. 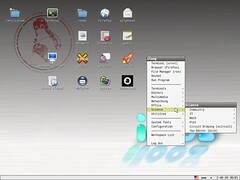 iloog is distributed in ready-to-burn ISO images. If you have downloaded one already and want to get the newer version, chances are that there is already a delta (binary patch) for you. If you haven't, you will need to download one. The mirror is hosted at the Computer Science Deparment of the University of Pireaus. Gentoo Linux users will have to emerge dev-util/xdelta first. For more info, documentation, frequently asked questions and changelog please visit the iloog wiki. Since iloog is a LiveCD, no installation is necessary. This means that iloog will not touch any of your hard disks by itself. To use it, insert the iloog LiveCD in your CD-ROM drive and restart your computer.